Please note that the content of this book primarily consists of articles available from Wikipedia or other free sources online. 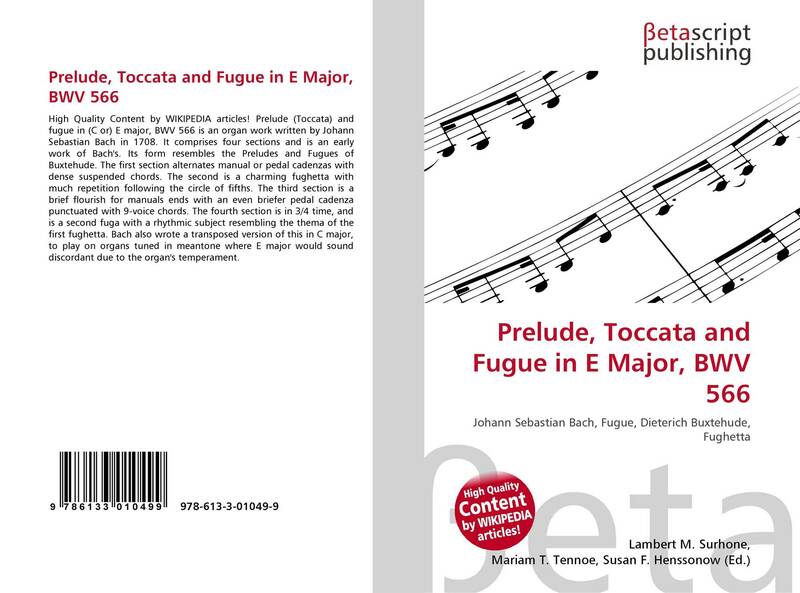 Prelude (Toccata) and fugue in (C or) E major, BWV 566 is an organ work written by Johann Sebastian Bach in 1708. It comprises four sections and is an early work of Bach's. 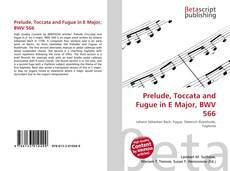 Its form resembles the Preludes and Fugues of Buxtehude. The first section alternates manual or pedal cadenzas with dense suspended chords. The second is a charming fughetta with much repetition following the circle of fifths. The third section is a brief flourish for manuals ends with an even briefer pedal cadenza punctuated with 9-voice chords. The fourth section is in 3/4 time, and is a second fuga with a rhythmic subject resembling the thema of the first fughetta. Bach also wrote a transposed version of this in C major, to play on organs tuned in meantone where E major would sound discordant due to the organ's temperament.